With THAAD in their backyard, both the Russians and Chinese will adopt counter measures. So don’t expect the American anti-ballistic missile system to contribute to regional security in East Asia. Hitting an incoming missile with a missile has been likened to hitting a bullet with a bullet. That is what America’s Terminal High Altitude Area Defence (THAAD) proposes to do. The son of Star Wars, THAAD is an anti-ballistic missile (ABM) system designed to shoot down ballistic missiles in their terminal phase – or moments before they hit ground zero. However, experts have called it impossible science because it works only in the minds of mad scientists. The Kremlin will never say this, but the Russians know that in reality the U.S. is burning billions of dollars in a futile quest to beat physics. As early as 1987, senior Russian scientists such as Roald Sagdeev had assured Moscow that Star Wars was phoney science. In 2002 the American Physical Society asked the U.S. to delay deployment of a missile defence system until it was demonstrated to work against realistic threats. Thirty years earlier, the physics community in the U.S. pointed out that existing and proposed missile defence systems were not effective against Russia’s offensive countermeasures. So why does Russia continue to oppose American plans to place ABM systems like THAAD near its territory – first in Poland and now in South Korea? The reason is THAAD is a disrupter. By creating an element of vulnerability, it will tie down other countries in a furious arms race. The Cold War gave rise to a fountain of acronyms, but none is more memorable than MAD or mutually assured destruction. What it means is that without the means to interdict each other’s missiles, Russia and the U.S. are assured of MAD if either of them launches a nuclear first-strike. ABM systems such as THAAD upend this – strangely comforting – balance of terror. If you think the other side can stop your missiles, then you create even more deadly missiles while also starting work on your own ABM systems. Like a nuclear chain reaction, this process can spiral out of control. If history has taught us a lesson, it is that vulnerable nations always start wars. The danger of deploying THAAD in South Korea is many orders of magnitude more disruptive than deploying in Poland. For, in Europe you only anger the Russians whereas in Asia you infuriate everyone – China, North Korea and Russia. Plus it will certainly pull in India and Japan, resulting in a crazy arms race. But doesn’t Israel’s Iron Dome work? 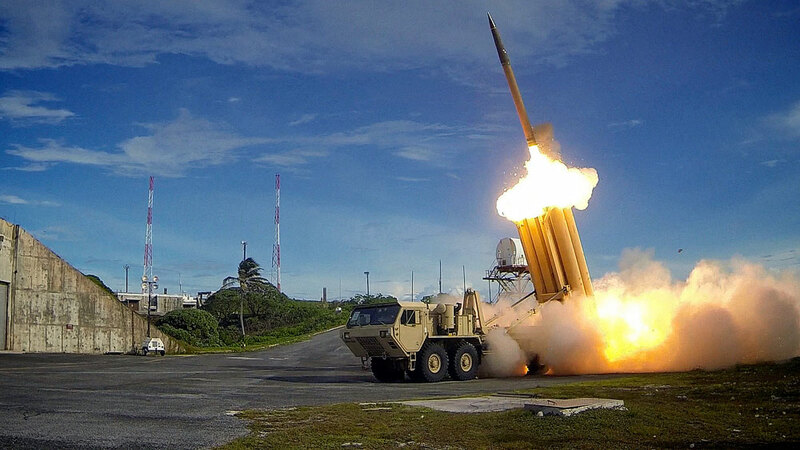 There are other reasons why THAAD is a weapon guaranteed to fail. The missile developed for THAAD does not carry an explosive warhead. Instead it relies on the kinetic energy of the impact to destroy the incoming missile. The reasoning is that a kinetic hit minimises the risk of an exploding conventional warhead. Plus, nuclear warheads are programmed to explode at certain altitudes so they hopefully won't explode upon a kinetic hit. But here’s the rub – chemical or biological warheads may disintegrate or explode and pose a risk of contaminating the environment. The result of a kinetic hit is that instead of the city centre, the missile may fall on the outskirts. This is not a very comforting thought for suburbanites. Older Russian missiles were famous for their brute power. The SS-18 (codenamed Satan by NATO) weighs a gargantuan 209,000 kg. The highly accurate Russian missile can not only penetrate and destroy American missile silos, which are hardened to 300 psi, but its own silos are hardened to 6000 psi, making the missile all but impregnable. But what the Russians have added to the missile is simply stupendous. For a missile of its weight and length (102 feet) it can sidewind, that is, during its terminal phase it can move in a series of S-shaped curves to evade antimissile defences. Plus, its micro-electronics are hardened to function even under nuclear attack. This means it can theoretically burn through a proximity explosion of an ABM warhead. Modern Russian missiles such as the Bulava are most likely to have sidewinding capability. Russia’s, newest ICBM, the RS-26 Sarmat, will soon join the Strategic Missile Force. It has been dubbed the “missile defence killer” for its maneuvering characteristics. “Neither current nor future American missile defence systems will be able to prevent that missile from hitting a target dead on,” said Russian Deputy Prime Minister Dmitry Rogozin. These new missiles will seriously erode THAAD. After the U.S. invasion of Iraq and the execution of President Saddam Hussein, an Indian diplomat remarked: “Never negotiate with the Americans without having a nuclear bomb.” The North Koreans internalised this pretty well and today they not only have atomic bombs but hydrogen bombs as well. Plus, they have the ability lob these missiles pretty far. Russia ranked world’s 2nd military power after U.S. In order to prevent the U.S. doing an Iraq on them, the North Koreans would have been content with an arsenal of a couple of dozen nuclear tipped missiles. Not anymore. For, THAAD is likely to spur them on to make even more bombs and missiles. Plus, with THAAD in their backyard, both the Russians and Chinese will adopt counter measures. So don’t expect the American anti-ballistic missile system to contribute to regional security. To get a measure of Russia’s technological lead over the West in ABM systems, you only have to look at what Moscow did according to the provisions of the 1972 ABM Treaty. The agreement allowed each country to erect missile defences to protect one city and one ICBM cluster. The Russians deployed an ABM system around Moscow and it is still around. On the other hand, the U.S. deactivated its lone system in North Dakota, in 1976. The U.S. has long engaged in Star Wars and never really believed it could create a viable missile defence system that deflects enemy missiles. On the other hand, the Russians – who were obsessed with defence after the trauma of World War II – continued to develop various classes of anti-missile missiles. These include the A-35, S-300, S-400 and the S-500. So at the moment and for the foreseeable future, Russia has little to worry about THAAD.